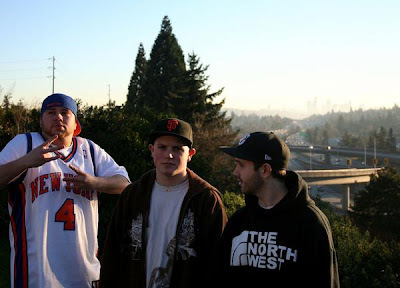 Nothing like rappin' up your Wednesday with some hip-hop heads outa Seattle. Came across the the KnowMads free album Saturdayzed today and I liked what I heard. Seattle hip-hop music is a very diverse genre. Starting to gain nationwide appeal from artists like the Blue Scholars, Seattle is no longer limited to the underground scene. But the underground is still alive and well with artists like the KnowMads. The trio bring together a little taste of the old school mixed with some heavy lyrics--a combination you just gotta nod your head to. Take a listen to these songs and if your like what you hear grab the entire album HERE for free. They also released there first official album, Seattle, late last year...so if your feel like supportin good underground music, buy it here.